Katrina Kaif avoiding media at award shows; Is Ranbir Kapoor-Alia Bhatt relationship the reason? 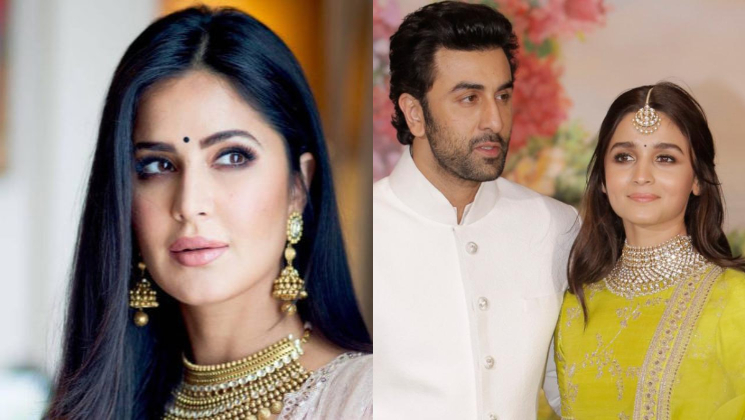 Home Bollywood Gossip Katrina Kaif avoiding media at award shows; Is Ranbir Kapoor-Alia Bhatt relationship the reason? Bollywood actress Katrina Kaif is generally a very cool and calm character. The actress doesn’t lose her cool quite easily and is a very level headed individual. But, recently Kat has been found avoiding media at the award shows and we wonder what is the reason behind this? The ‘Jab Tak Hai Jaan‘ actress over the years has always maintained cordial relations with the media. Katrina Kaif in the recent past has had a turbulent phase regarding her personal and professional front. The actress a much-publicised break-up with top Bollywood star (read: Ranbir Kapoor) . Could Alia Bhatt‘s relationship with Ranbir be one of the reasons? And her last couple of releases ‘Thugs of Hindostan’ and ‘Zero’ have also not done quite well at the box-office. Meanwhile, Katrina Kaif is now eagerly awaiting her next release ‘Bharat’ and would be wishing that it can bring her some luck. The Ali Abbas Zafar directorial will showcase Salman Khan’s character’s journey from an 18-year-old to a 60-year-old. The film is an official remake of a Korean film titled, ‘Ode To My Father’. ‘Bharat’ also features Disha Patani, Nora Fatehi, Tabu, Jackie Shroff, Aasif Sheikh, and Sunil Grover. It is all set to hit the theatres this Eid. Here’s hoping Kat can bounce back in style and proves that her class will forever remain impeccable.